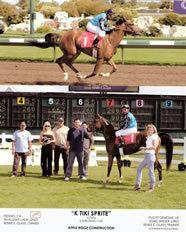 We have been involved with Arabian Racing since 1983 when we aquired our first racing mare, Fulfilled Dream. And fulfill our dreams she did! With Lynn Ashby as trainer, she was first Race Mare of the Year in OR and then went on to be named by Arabian Horse World as the number one Arabian 4 year old race mare in the US. She proved to us that racing Arabians can not only be beautiful atheletes on the track but also the best of family companions back home on the ranch. The true Arabian in our book! Three of her daughters grace our pasture. Since then we have raced well for a small breeding farm and bred a National Hall of Fame Arabian Race Horse, Dreams of Valor. 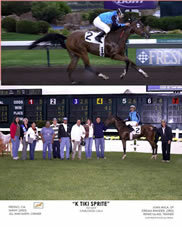 Our Twin Firs So Lovely held two track records, one in California and one in Kentucky for many years. K Tiki Tyme was race mare of OR twice and became a great broodmare of future generations of winners.